With planning of the new trench extension complete, excavation is resumed. It is hard to believe that one-third of the digging season on the Ness is over already. For some of the diggers and students, as you can see below, their digging adventure is finished, at least for this year. Many of the visitors to the site are astonished that the digging season is so short. A quick description of the financial, logistical, organisational and human factors involved in mounting the dig (to say nothing of the necessity of embarking on vital post-excavation analysis) usually convinces them that six weeks might just be enough. Six weeks of today’s afternoon’s weather would certainly be more than enough. The morning was beautiful, but the afternoon descended into intermittent bouts of heavy rain and wind. The heroes of the day were the aforementioned visitors, who pulled out their hoods, tightened their collars and bravely allowed themselves to be led round the dripping site. The geographical range of visitors to the site is astonishing. Site director Nick’s daughter Megan has gifted her map of the world to one of the public huts on site and visitors are encouraged to identify their homes. In the last three days, we have had visitors from Mauritius, Tanzania, India, Canada, USA, Italy, France, Germany, Cyprus, Australia, New Zealand, the Czech Republic and Switzerland. The archaeology has been well-worth the effort for these far-travelled visitors. In the north-western corner, the investigation of the new walling and paving there has also meant that the outer face of Structure One has also been more exposed. Most surprisingly, there appears to be a kink in the wall, which may turn out to be a carefully constructed recess in the outer revetment wall. Further investigation next week will clarify this mystery. More mysteries have turned up in Structure Twelve. The recess or blocked entrance in the south of Structure Twelve. There is what appears to be a blocked entrance in the south wall, directly opposite the narrow and angled entrance in the north wall. Again, this may turn out to be a recess and bets are being taken, to be settled next week. More of the stupendous stonework in Structure Twelve is also being revealed, with more hints of this building’s original grandeur revealed in the numerous peck-dressed blocks recovered from the collapse in its interior. In Structure Ten, there has been a good deal of head-scratching in an attempt to more clearly understand the sequence within the structure. It seems now that the “dressers” can be assigned to the second-phase remodelling of the interior of the structure, when the central chamber was made cruciform in plan. Apart from the incorporation of some beautifully dressed stone, the “dressers” are rather shoddily built, similar to the secondary internal wall faces with which they are contemporary. 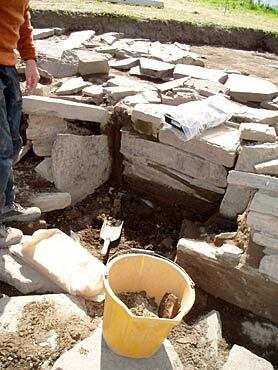 Perhaps the dressed stone is reused from earlier versions of the dressers that relate to Structure Ten’s original plan – time will tell if we are correct..
Assessing the stratigraphy in Structure Ten has been complicated by the extraordinarily mixed nature of the rubble/midden/clay infill, which is particularly difficult to interpret, and to excavate. It would seem at present that this may well represent a levelling layer (that seals the primary floor) but also formed the floor for its secondary phase. Professor Mark Edmonds, who has also been working in Structure Ten, examining the robber cut in the north wall, has come across a huge block of rock. This has been identified as camptonite, which is the same rock as the large, broken standing stone in the forecourt of Structure Ten. More on this later. Shannah displays another fine find from Structure One. Meanwhile, in the south end of Structure Eight, Dave has been finishing off recording in the central midden area and this particular task will be vital for the clarification of the whole sequence of the site as the excavation progresses – may mean a refinement of the overall site phasing!. A well-deserved weekend off for all the team and already looking forward to next week when who knows what discoveries will be made – watch this space! Shannah has, once again, struck ‘gold’ in Structure One – not satisfied with her fine flint blade earlier this week, she has discovered a rather fine, partially polished stone tool. After being here for two weeks, getting to know the site, working with the volunteers and staff, it is time to say goodbye for some of us. Two weeks really is not long enough to participate in a project like this for. Having heard about the Ness of Brodgar project from a newspaper clipping in Canada back in January, and with relatively little experience of the archaeology of the Neolithic, my expectations were exceeded. It is a remarkable site to work at – the massive architecture, the settlement planning, the finely and delicately decorated stones. How did people move from being hunter gatherers to creating these sorts of structures? Particularly ones like those on the Ness, which are likely not domestic structures. 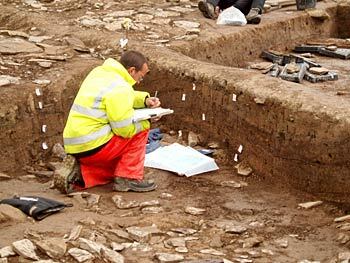 Dave finishes the record of sections in the central midden area. I do not study the Neolithic but after having been here I find these questions particularly important and exciting. Furthermore, I think that the Ness of Brodgar site is important because we are able to see something beyond tombs, houses and henges. People are fascinated and intrigued by henge sites but the Ness has the potential to reveal a very different part of the world of the Neolithic. The Ness is located between two massive henge sites and is flanked by tombs and settlements. It appears to be the core within the Heart of Neolithic Orkney. The team has been incredible to work with. I have never worked with a more professional staff than those from ORCA. The volunteers are a very special group of people and it has been a great experience to learn and work alongside them. I hope that this will not be the last time that I get to come here and be a part of this amazing pursuit. This is Alice and Amanda from UHI. 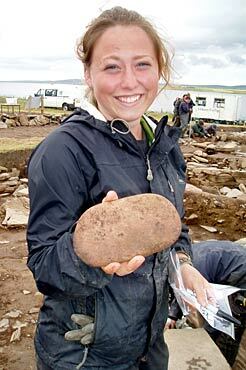 We are coming to the end of our two weeks here at the Ness of Brodgar and are sad to be saying goodbye (for this year). Our experience here has been amazing; the whole team has been fantastic to work with and we have learned so much in this short space of time. It has been great to finally put theory into practice and see, first hand, what goes on here at the dig. 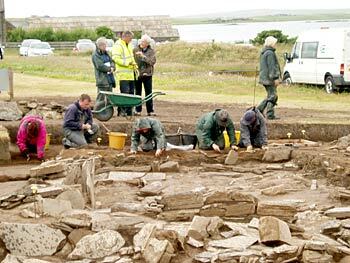 Seeing how the Ness of Brodgar is becoming a major part of the Heart of Neolithic Orkney has been eye-opening and we are sad to miss out on what else the Ness has to reveal in the coming weeks. We would both like to say a big thank you to our supervisors and Nick for their patience in teaching us and hope the weather gets better for the rest of the dig.